“I was born in George Town, Grand Cayman, on the 24th of May, 1910. My mother died when I was a baby, and my father married one Matilda Ebanks. Matilda had a sister whose name was Leona, and she used to keep school in her mother’s home where we were staying whilst my father’s house was building. She had about eight pupils. After Leona left Cayman and went to Isle of Pines, Cuba, I went to school to Miss Jane McCoy for some time. She also taught at her home, and then I went to Government school on the Water Front. We had to pay three-pence (3 pennies) every Monday. In 1920 I went to Jamaica with my stepmother, Matilda, my aunt Lida, and my cousin Selvarine Ebanks. My father was working up there, running passengers from Santiago, Cuba to Haiti. During the time I was there, I went to East Branch School. My sister Iva, was going to West Branch. After my mother died, there were three of us children. So we had to split up. Iva, she went to live with my aunt in Jamaica. My aunt’s husband was also working on ships as my father was, running passengers between Santiago, Cuba and Haiti. So my eldest brother and I stayed with my father in our home after it was finished. When I came back from Jamaica, I went back to school again, and I stayed there until I was 14 years old and my time was up. Bye-bye school. Anyway, I never done bad. I reached to 6th standard, but I was only in for a few weeks, when the teacher, Mr. Ulric McNamee told me I had to leave. So I took evening lessons from another teacher, Mr. Hitchmon. I stayed there for a couple of months, and I told my father I did not like going there anymore. So I had to take care of the pigs and donkey. I had to keep fire going day and night because the mosquitoes were so thick. At this time my father was still sailing. I had to do everything: cut wood; pull grass out of the plantation; everything. So what I used to do, I worked for about five or six people first, and then when I was ready for my work, I let them come to me. I cooked for them that day, so I got lots of work done in one day. So around 1929 I started working around the Merren’s store and cutting their cow pastures. Lots of us boys used to do that. Some nights we had to pick out apples, cabbages, potatoes, onions etc. You see, those goods had to come from New Zealand and England, so when they reached here, lots of them were spoiled. So we had to pick out the good from the bad. We crated them. So, in 1931 I started to go to sea. I was 21 years old then. When the captain of one schooner came to the house to look for me to go on the boat, my father told him I could not go; that I was too young. So the captain asked how old I was and he said, 21. So he told my father if I wanted to go he would carry me. So I went as cook on the Gold Medal. She was owned by Mr Cornwell Watler. We went to the Mosquito keys to catch turtles. My second boat was the Reward, owned by the Pantons, and the third, the Albion, was owned by the Merrens. One evening, one of the Merrens’ sons told me he wanted a sailor for the Albion. I said I would go. Ducan said I was a cook, not a sailor, but the next morning, he came to me again and asked me if I really meant what I said. So he said if I did not like it, I could come back to the shop. I did not know anything about sailoring, but whilst cooking I had been watching what the sailors were doing on deck. That was Friday I told him I could go. On Saturday, Ashley drew the compass card with points and he painted it for me on Sunday, and I learned some of it. Then I went to church Sunday night. When I came out, I started learning the compass with my flashlight. When I woke up on Monday morning, the flashlight was burnt out but I had learnt all about it. I made two trips to the Keys and two to Jamaica with logwood. So I went back to the shop again. In 1932 I went as cook on the Rembro, owned by Doctor Roy. In 1933 I sailed on the Armada, owned by Melarb Connolly. In 1934 I went on the Albert H. She was owned by two brothers, Capt Bertie and Albert Bodden. We used to go to the Keys to catch fish and lobsters and took them into Panama for the Commissary Division Supply De Panama Canal. In 1935, I married Hyacinth Lorna Ebanks. To this marriage we have two daughters, Trella and Jolene. In 1936 I went on the E.L Banks, owned by Prentice Powell of West Bay. In 1938 I went on the Arbutas No.1, owned by Capt. Warren Bodden. Also in 1938, five men came from Oxford University Biological Expedition and stayed for three and a half months. I cooked for them. We camped in South Sound one week, Bodden Town one week, East End one week and North Side and West Bay one week. In 1940 I went on the W.H Arbutas 2. In October of 1941, I joined the Admiralty tanker Bishopdale out of London as second cook and baker. We sailed out of Kingston, Jamaica, on 31st of December 1941 bound for Bermuda to bunker and take on supplies and left for ‘don’t know were.’ That was when the trouble started. Out on that Pacific at night the ship is dark and locked up. Only when you open your room you get light. We were 68 days at sea before we got to land, and we started to fuel ships. On our way to Australia, we fueled the Warspite, one of England’s big battleships at Henderson Island and the Queen Elizabeth at the Marquesas Islands. At the time, she had 10,000 troops on board. After entering Australia, we fueled the Australian and American fleets. We went into Australia in dry dock and then on to Noamia, New Caledonia, as a supply ship. Our contract was up in June, so we left the ship in Sydney, Australia, awaiting repatriation back home. We were there for three weeks, and then we had to go to Melbourne, Australia, to catch the Arthlone Castle, and she took us to New Zealand. We spent 11 days there, and then we were on our way to the Panama Canal. We got to Balboa Quarantine Station on the 08 September 1942, and we stayed there until November before we got to Jamaica, then on to Cayman. In 1943 I went to work for Webster Steam Ship Company in Jamaica. I started in March and left them in May 1945 and went to the States on an American tugboat, the Syassert, running between San Juan, Puerto Rico, and West Palm Beach, towing two barges of various cargoes. When the Japanese war was ended in August 1945, I was discharging corn in Havana, Cuba. We left there that said evening for West Palm Beach. That’s when our contract ended. We left the next day for Bayonne, New Jersey, to deliver the ship to the Thompson Transportation Company, and in September I came down to Miami and started shipping out again. My first ship was the Birdie H. out of Norfolk, Virginia, and the Captain Algie Fautardo was Caymanian. We left Puerto Barrios on Thursday morning with a load of bananas for Miami. Our chief engineer got sick and we were going to Belize to land him, and at 02:17 Friday morning, 8th of February 1946, we struck Glover Reef and the ship stayed there, and when we struck, all lights went out. All in darkness. I was the cook, so I managed to get breakfast. The stove is diesel, so I ran her full of oil. I had a large smoked ham, so I cut it in two and boiled it for the two lifeboats. We left the ship around 11am Friday morning for Belize. I was in the Captain’s boat and the sick man was in the chief’s mate’s boat. So we arrived at Belize lighthouse that night about midnight. So we had to wait for the chief mate’s boat to catch up with us. We went to Belize on Saturday and we took the sick man to the hospital and then we went to a hotel and stayed there for 11 days. Then we left for Miami. In 1946, in July, I joined the Migrant, so I stayed there until September 1947. In October I joined the B.F Moody, a Dredging Division ship in Miami. In 1948, May, I joined the Rexton Kent in Miami. I stayed with the Company for six years, four years running bananas from Santa Marta, Columbia, and two years in Canada, sailing on various ships. I went to Canada in 1952. 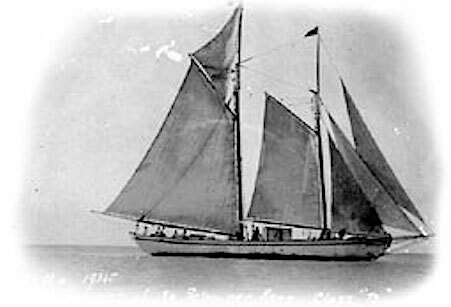 The names of the ships Mr Urban Myles sailed on, according to their categories, were as follows: Schooners included Gold Medal, Reward, Albion, Armada, Albert H, E.L. Banks, Arbutas, W.H. Arbutas 2, and the Majestic. The motor-powered ships included Bishopdale –Kirk B, Armenda –Mexico, Smaland –Samana, Syossut, Birdie H., Migrant, B.F Moody, Rexton Kent, Inagua Wave, Inagua Foam, Inagua Shipper, Inagua Crest, Inagua Bay, Inagua Pilot and Inagua Island.